A warm shredded brussel sprouts salad with kale, quinoa, crispy bacon, avocado, pear, walnuts, and a warm bacon-cider vinaigrette. 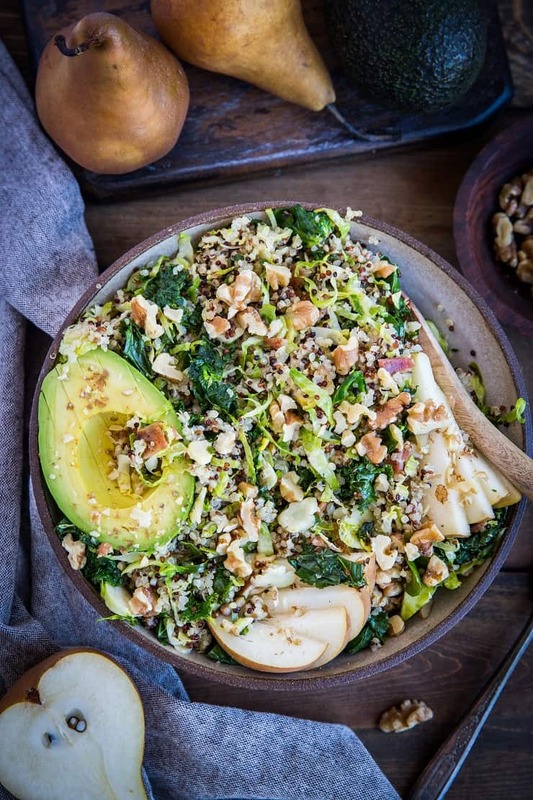 This nutritious salad is inviting during the cold weather months. I created this recipe for The California Avocado Commission. You can skip to the recipe HERE or continue reading. How do you feel about warm salads? I’ve gotta say, I absolutely love them! If you’re a salad fiend, you may have noticed raw vegetables can be a bit tough on your digestive system. 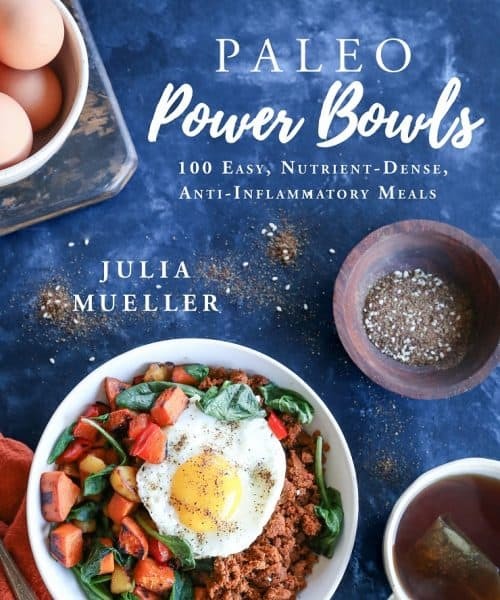 All it takes is a quick steam or saute to soften up the fibers so that your GI tract processes them easier so that they don’t cause GI upset and the nutrients are better absorbed. I find lightly sauteed hearty greens like kale and brussel sprouts make for a filling salad that is easy on the digestive system and so cozy and inviting during the fall and winter months. With fall rapidly approaching, I’ll be whipping up warm salads regularly for lunches and dinners. This salad is loaded with goodies! 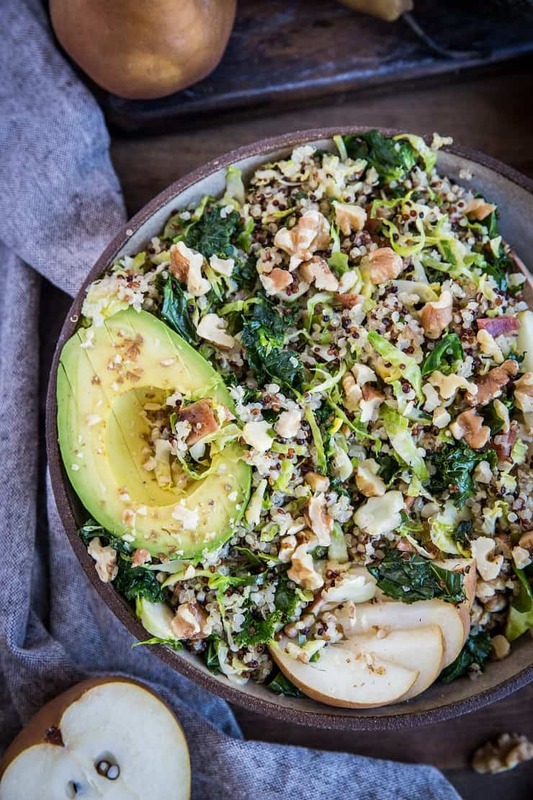 Shredded brussels sprouts, kale, quinoa, California avocado, sliced pears, and toasted walnuts make up this nutritious texturally-pleasing dish. The whole thing is tied together with a simple bacon-cider vinaigrette for a straightforward yet comforting and nourishing meal. Essentially, it checks all the boxes! And speaking of bacon…It really makes this salad sing! We use the bacon fat for the dressing and chop up the crispy cooked bacon to incorporate it into the salad. It’s one of those features you won’t want to skip! I almost always pair my vegetables with avocado. 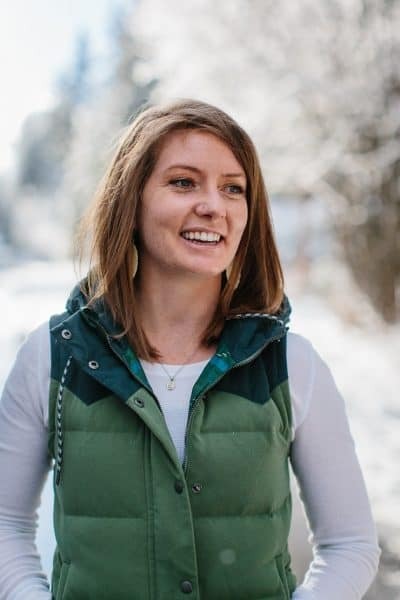 I’ve found combining vegetables with the healthy fat of avocado makes the whole experience incredibly tasty, plus your body loves the fiber-fat duo, as fat helps your body process the otherwise difficult-to-digest vegetation slowly yet efficiently. 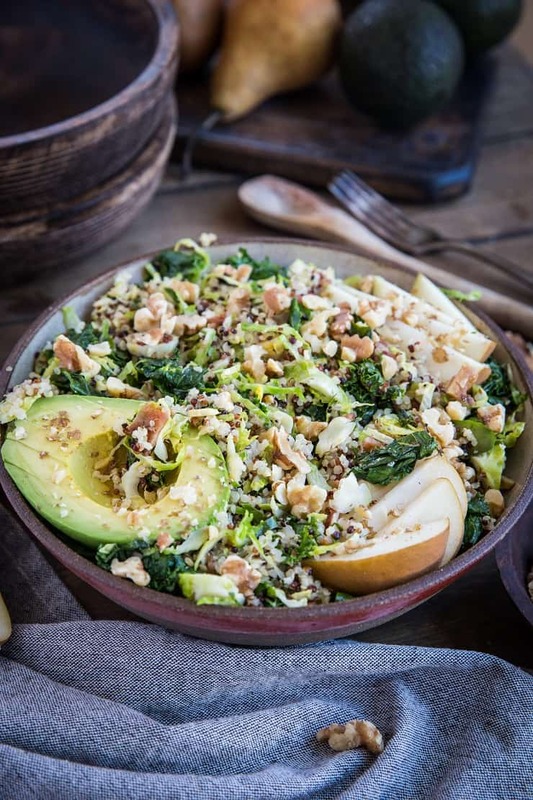 Crunchy brussel sprouts, kale, quinoa and bacon provide that heartiness you can sink your teeth into, the pear provides some sweet counter balance to the tangy bacon vinaigrette, and the avocado lends the hearty creaminess to every bite. Per usual, there are lots of opportunities for making this salad unique to your palate. Here are some examples..
Add ground cinnamon and freshly ground nutmeg for some fall essence. Mix in some roasted vegetables, like butternut squash and carrots. Swap the pear for apple. Toss in some pumpkin seeds or pecans. Serve with your choice of protein for a complete meal. Avocado? Bacon? Hearty vegetables? What’s not to love? Click here to view my Warm Shredded Brussel Spouts Salad Recipe! If you love the concept of warm salads, check out my Roasted Vegetable Warm Kale Salad with Rice as well! Similarly, if you love salads with brussel sprouts, have a look at my Shaved Brussel Sprout Salad with Roasted Butternut Squash , Brussels Sprout Chopped Salad with Warm Bacon Vinaigrette, and Shaved Brussels Sprouts Salad with Blueberries. This is truly my kind of salad! I’d love making a big batch of this to eat every day for lunch, and I definitely wouldn’t skip the bacon! I love warm salads in the fall! Literally love every ingredient in this salad; can’t wait to put this on my list of meal-prep for lunches! YUM! This looks absolutely amazing! I can’t wait to make this. Thank you, Jane! Let me know how you like it! This looks absolutely delicious! 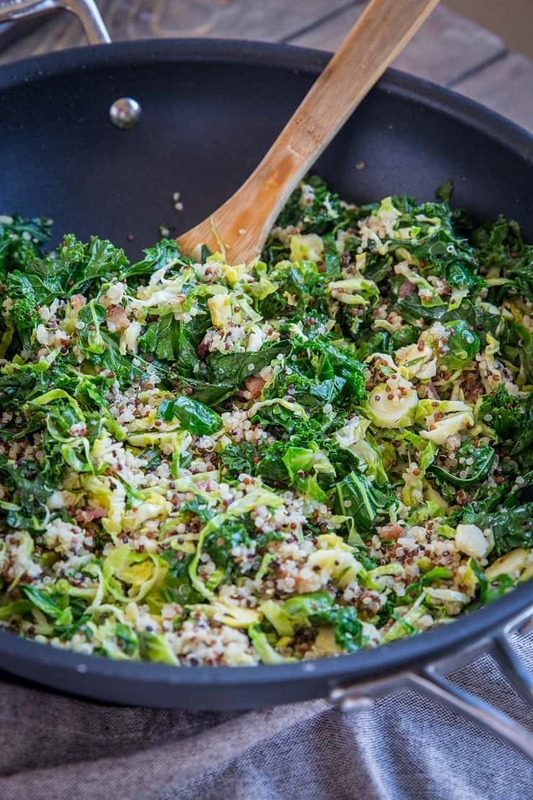 What a great way to enjoy brussels sprouts!